When Iacocca started at the Ford Motor Company, he, along with other new engineers, were given a graduate scheme rotation of Ford’s numerous stages of operation. 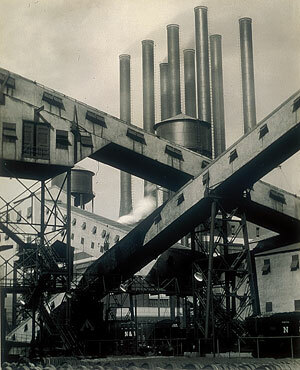 Over a period of 9 months they saw River Rouge Plant, which was the largest manufacturing site every built at the time, from every stage of the manufacturing process. Lee worked in the coal and lime stone mines, which were used to turn steel into cars. The jobbing foundry, which produces a single casting of a steel pattern, the production foundry, the ore boats, the tool and die shops, the testing track, forging plant and of course the assembly line at River Rouge. 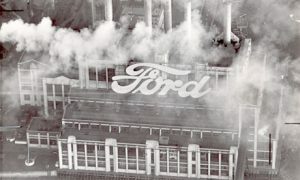 The River Rouge plant, according to Iacocca, was the pride of Ford and many competing car companies made their pilgrimages to Detroit and Dearborn in order to see how it was done first hand. One important early lesson was that new engineers were to be treated with distrust (or even as spies) by the union workers. These college-educated neophytes were not to be trusted by the work horses within the company. Vertical integration was the approach taken to develop Ford Motor Company and the River Rouge Plant. By definition, vertical integration gives Ford complete control and complete ownership of every aspect of production from the resources to managing the waste. Vertical integration is the antithesis of the modern global auto-manufacturing that sources parts from the most cost effective source. At Ford, it was about saving money because free-trade was not widely accepted. Even the brown gas created in the coke ovens was redirected and condensed to create a light oil which was used in dealerships, the substance was called Benzoil. The iron was put in a molten state in order to create one solid engine block. Every scrap of wood, rubber or metal would be used. Waste from dust in the grinding wheels is reconstituted. Saving a few seconds at one point in the production can be used subsequently in the production process.